Every week we take a peek inside the lunches of the luckiest kids in Brooklyn. Read on, suppress your jealousy, and get a little brown bag inspiration. As chief lunch maker, I take easy wins when I can. 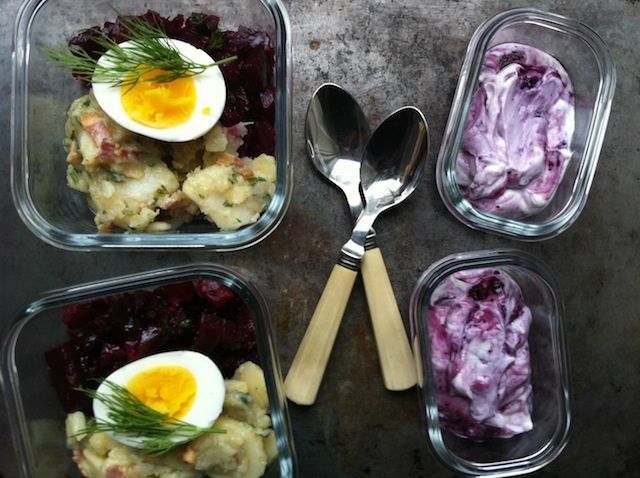 I was at a shop that makes great vinegar- and bacon-laden German potato salad and beet salad, and -- ding! -- lunch was checked off the list. In the morning, I hard boiled an egg, split it between each lunch, and added a sprig of dill so my kids don't think I've totally given up trying. For dessert: Greek yogurt with blueberries. And yes, it's from a package (Fage) -- I just spared you the plastic container in the photo. In between lunches where you really make an effort, I recommend a few like this to maintain sanity. What's in your lunch today? I put the eggs in the pan, covered with water, brought the water to just under a boil, then shut off the heat and let them sit for 9 minutes. Yes! I bought a tuna salad wrap that looked really attractive the other day, the tortilla spinach and tomato, and cut on the bias. He ate it.